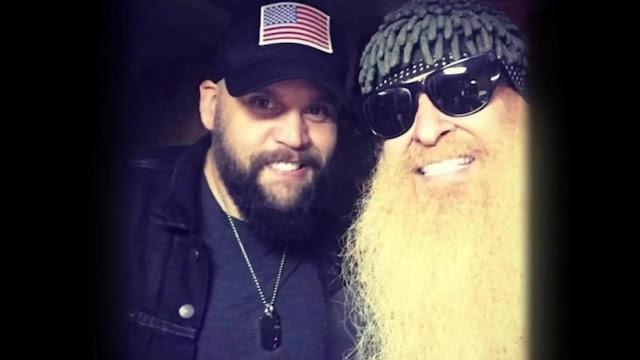 "America's Got Talent" finalist Benton Blount (left) said he was kicked off a tour opening for ZZ Top guitarist Billy Gibbons (right) after posting a selfie on Facebook in which he's seen wearing a red "Make America Great Again" hat — the iconic symbol of President Donald Trump's campaign — as well as an "I voted" sticker and holding a Chick-fil-A sandwich and drink. “America’s Got Talent” finalist Benton Blount said he was kicked off a tour opening for ZZ Top guitarist Billy Gibbons after posting a selfie on Facebook in which he’s seen wearing a red “Make America Great Again” hat — the iconic symbol of President Donald Trump’s campaign — as well as an “I voted” sticker and holding a Chick-fil-A sandwich and drink. The post’s caption read, “Someone reading this just got offended multiple times. My work here is done! #Vote,” the Greenville News reported. Blount said he drove from Greenville, South Carolina, to Atlanta for last Wednesday night’s show and learned he was no longer on the bill, the News said, adding that Blount was four shows into a seven-show slot opening for Gibbons. A spokesman for Gibbons’ tour said Blount was “disinvited to continue the tour because of a creative decision,” WHNS-TV reported. Blount told the News he didn’t speak to Gibbons directly. He added to the paper that he often shares politically themed memes and takes part in “poking fun at politics” on his podcast page but that the photo in question was posted on his personal Facebook page.